Yeah, but: Canon E1. Yes, Canon. 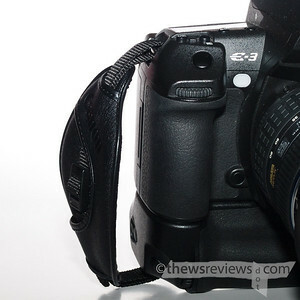 The Long Version: Camera hand straps are an interesting solution to an obscure problem. 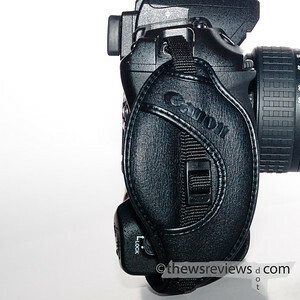 The Canon strap only attaches to bodies with a portrait grip, whether integral or accessory, and makes it impossible to reach the portrait grip. So to use this $60 strap you'll need to spend about 150-300 dollars to add a lot of bulk to the bottom of your camera with no real additional benefit except for the ability to carry a bigger battery. As you can imagine, this isn't a need that's screaming out to be filled. But beyond my desire to own something that pays homage to a classic camera, I also happen to own a battery grip that I don't particularly like to use in the portrait orientation. I've found that the HLD-4 on my E-3 doesn't feel as solid as I like when I have a big lens attached, so I don't shift my grip much. This makes a hand strap perfect for me. The Canon strap isn't particularly convenient to adjust, which makes it harder to use during the winter - I shoot with two different weights of gloves outdoors, and without gloves when I'm inside. The strap length is currently at a medium position that compromises its snugness, but it does still provide a sure and comfortable grip on the camera. Once glove season is over, I'll be able to tighten it up a bit. The hand strap is different from a wrist lanyard - my usual choice - in that it actually increases my ability to hold the camera, instead of just being an insurance policy. I've always preferred to hold cameras instead of hanging them around my neck; while I can appreciate the value of neck/shoulder straps for cameras that predate the invention of ergonomics, I find that hand-carrying heavy cameras is both easier and more comfortable. My subjective impression is that the hand strap also adds some solidity when shooting, making it easier to stabilize the camera for longer lenses and (very slightly) longer exposures. It's nothing compared to a monopod or in-camera image stabilization, but it certainly feels more solid. The compromise is that it makes it almost impossible to shift my grip enough to reach the arrow pad on my E-3's back. Life's a barter. The irony is that I'm disappointed by the build of the Olympus HLD-4 battery grip, but like the camera-and-grip combination for a normal (horizontal) hand position when I'm shooting vertically. But to get the most benefit out of the larger grip surface, which helps when swinging the camera around, I've also had to commit to keeping the battery grip attached and losing out on the ability to switch the camera to its smaller native configuration. Sure, technically the grip strap can be removed, but it adds enough effort to the switch that I'm not likely to do it. When DPReview.com wrote their conclusions for the Olympus E-330, they called the new feature of Live View "a solution looking for a problem". That's how I want to describe the idea of a hand strap as well. At least there's no way I can misjudge the future of DSLRs as badly as Phil Askey did; the Canon hand strap really is a specialized product for a very specific set of criteria. It works for me, and I'm happy that I have it on my E-3, but I'd never cripple my E-1's excellent battery grip by adding a hand strap to it. Different people, and different cameras, need different solutions. How do these attach to the bottom? I never use a neck strap with the Alpha and am contemplating a hand strap so I don't have to grip it as hard while walking around, and leaving a lot of sweat on my grip. Will it interfere with tripod use? My price is more like $10-15. There's a second strap lug recessed into the bottom of the HLD-4 battery grip, and the hand strap threads through it and the lug on the right side of the camera body. (There's also a secondary attachment piece to allow a shoulder strap to be used as well.) So the battery grip's essential, but it doesn't interfere with the tripod at all.